Tonight, Dj Forrest performs for Parker and Rachel at The Gathering in Bellaire. The Meridian Reception Hall in Houston is our newest achievement and is the perfect location for your wedding reception. After a stressful day of planning, picture taking, and constant rushing about, you need a reception venue that allows you to relax, enjoy great food, and celebrate with all your guests. 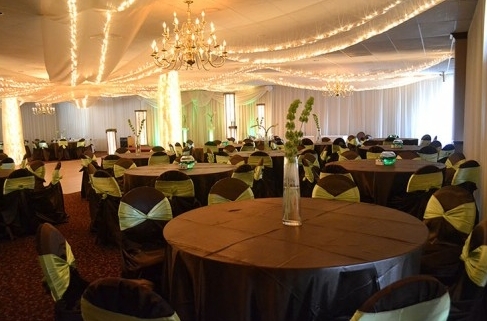 Our beautiful Houston reception venue affords your party the luxury of an elegant setting at an inexpensive price. The Meridian Reception Hall in Houston was designed to cater to wedding parties looking for an extravagant venue to host their guests after their wedding. Our catering offers you great food and great service at great prices! Our vast catering menu is guaranteed to have something for everyone and is completely customizable to ensure the lovely couple is satisfied. We also offer a range of sit-down and buffet packages and we can make arrangements for any of the otheramenities you may desire. We also provide additional, full-service add-ons including: wedding cake, DJ’s, photographers, security, and bar service, all of which help ensure your guests have an amazing time! With the Meridian affordable reception hall in Houston, you can have the elegant reception of your dreams at an inexpensive price, leave the details to our staff of qualified individuals, and actually enjoy your own event! Contact us today for more wedding planning details.